We’d love your help. Let us know what’s wrong with this preview of If You're So Smart, Why Aren't You Happy? by Raj Raghunathan. Fifteen years after getting his MBA, Raj Raghunathan spent some time with his old classmates. He noticed that though they’d all done well, there didn’t appear to be much correlation between their academic success and career success. What Raj found even more curious was the even smal Could the same traits that drive your career success also be keeping you from being happier? To ask other readers questions about If You're So Smart, Why Aren't You Happy?, please sign up. Be the first to ask a question about If You're So Smart, Why Aren't You Happy? I like this book. The title is very captivating and that's the main reason I choose to read it. I didn't know anything about related Coursera courses and that there was actual research on happiness. I really enjoyed reading the book, because it is really straightforward and helped me to acknowledge a new and interesting world. I liked when the author showed how happiness can be defined (not relying only on abstract concept) and I also liked how he addressed the problems (sins) and the viable solu I like this book. The title is very captivating and that's the main reason I choose to read it. I didn't know anything about related Coursera courses and that there was actual research on happiness. I liked when the author showed how happiness can be defined (not relying only on abstract concept) and I also liked how he addressed the problems (sins) and the viable solutions. Although, some solutions are impracticable (at least for me). Clichés be damned – I'm kicking off the New Year with a self-help book. Like most titles in the burgeoning "happiness research" genre there is no silver bullet to feeling good all the time to be found here. But I was pleased to see a lot more research cited than simple gut-level feel-good philosophy. Dr. Raghunathan seems like a warm and wise fellow who'd be fun to talk with, and his personality helped buoy this book up above my expectations going in. Still, like every self-help book out there th Clichés be damned – I'm kicking off the New Year with a self-help book. Like most titles in the burgeoning "happiness research" genre there is no silver bullet to feeling good all the time to be found here. But I was pleased to see a lot more research cited than simple gut-level feel-good philosophy. Dr. Raghunathan seems like a warm and wise fellow who'd be fun to talk with, and his personality helped buoy this book up above my expectations going in. Still, like every self-help book out there this all proves easy to sum up but difficult to implement. Why am I unhappy? Well, it's mostly because I "devalue happiness" and confuse the means of being happy (i.e. money) with the actual feeling itself. More to the point, the straight-up explanations for not being happy are threefold: (1) poor social relationships (guilty! ), (2) lack of purpose (working on it! ), and (3) not cultivating a positive attitude, which is defined here as a realistic sense of control in various situations (my therapist agrees). The full text expands on these principles with current research findings, engaging anecdotes and examples, and a handful of practical exercises suggested to identify and increase your happiness quotient w/r/t each. But it's all easier said than done and, to be honest, most of the information and findings documented here can be gleaned more quickly from a Google search and an afternoon watching a few TED Talks. So unless you're brand-new to the subject of the psychology of happiness you may find a lot you've already heard elsewhere in this one. 3.5 stars out of 5. I technically did not finish since I skimmed/skipped outright large portions in the middle, as we talked about topics I've already covered extensively, like "flow" and Harlow's monkey attachment experiments. As a self-help book, it is better than average but still no positivity panacea. What sets this one higher than your run-of-the-mill self-help book is the author's inviting personality, the hard evidence cited, and the fast but effective personal inventory exercises*. I can actually see myself taking some action based on this title, which is what self-help should be all about. A Business school professor examines happiness, with some interesting conclusions. Strongest impressions from the book: first 2 chapters about how people devalue happiness and focus on the activities that they think will bring them happiness. Often we do this because happiness is hard to measure (unlike money, for example). Define what happiness is for you and make choices to prioritize it. Other strongest takeaway - that people, even strangers, are more deserving of trust than almost anyone giv A Business school professor examines happiness, with some interesting conclusions. Other strongest takeaway - that people, even strangers, are more deserving of trust than almost anyone gives credit for. Suggests using "smart trust" that limits downside, and trying to simply put ourselves in others' shoes - when we forgive others we reap the benefits emotionally. He focuses on having the right approach to achieving Mastery, Belonging, and Autonomy - which involves the belief that these things are abundant, not scarce. Scarcity implies a zero-sum game and makes happiness hard to find. For mastery, finding "Flow" is key - work that you have talent for and enjoy but that challenges you and does not come at a cost to others. Do not try to be superior to others. He suggests you ask yourself "What is the best possible life" as an exercise. And when things aren't going well, to have self-compassion. For belonging, it is the need to love and give, not the selfish need to be loved, that promotes happiness. For autonomy it is having internal control, where he focuses on having process-oriented goals, rather than outcome-oriented ones - that way we can derive happiness from the effort even if it doesn't end up exactly how we had hoped. He conducts an exercise to have you think of some negative event in life (not truly awful, though) and reflect on how much it hurts now vs when it happened and how meaningful the event is in our lives. Negative events tend to hurt less but actually carry a lot of meaning in our future lives - they often drive positive consequences. I'm reading multiple books on the topic of happiness at the moment and this was one of them. It's a solid, research-based approach to what makes us happy. Every chapter is divided into two parts: first a research based analysis and then a more practical exercise to put theory into practice. I didn't follow the recommendation of doing a chapter each week or so and doing the exercises, since I just wanted to read the whole book first. Not everything the author offers is new or groundbreaking, but I'm reading multiple books on the topic of happiness at the moment and this was one of them. It's a solid, research-based approach to what makes us happy. Every chapter is divided into two parts: first a research based analysis and then a more practical exercise to put theory into practice. I didn't follow the recommendation of doing a chapter each week or so and doing the exercises, since I just wanted to read the whole book first. Not everything the author offers is new or groundbreaking, but the overall picture was pretty impressive and challenged me. I'm gonna go through the book again to do all the tests (which i thought were awesome) and see which exercises I want to try for myself. I received an advance reading copy of this book, for free, through Goodreads First Reads program in exchange for my honest review. 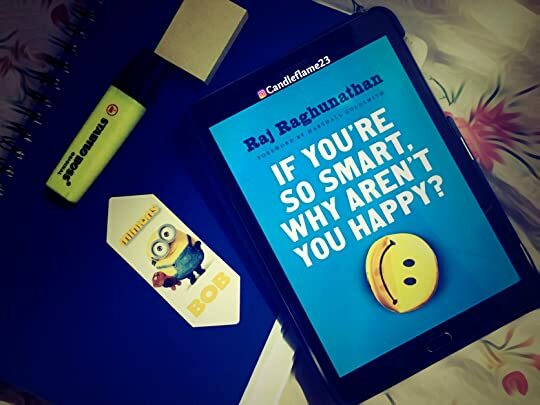 If You’re So Smart, Why Aren’t You Happy?, by Raj Raghunathan, seems like your run-of-the-mill, depression, self-help book. What differentiates this one from the others is that the author is not an M.D., nor does he have a background in psychology. Instead, Raghunathan is a business professor who sets out to find how people who are both smart and successful, can still I received an advance reading copy of this book, for free, through Goodreads First Reads program in exchange for my honest review. 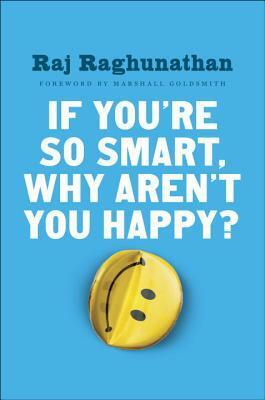 If You’re So Smart, Why Aren’t You Happy?, by Raj Raghunathan, seems like your run-of-the-mill, depression, self-help book. What differentiates this one from the others is that the author is not an M.D., nor does he have a background in psychology. Instead, Raghunathan is a business professor who sets out to find how people who are both smart and successful, can still be unhappy. The author comes across as likeable, and very passionate about his chosen topic. The book seems to be a labor of love, thoroughly researched, and meticulously referenced. There is nothing really groundbreaking or profound about his conclusions. He obviously has read many books regarding depression, and he includes many assessments previously found elsewhere. Unfortunately, Raghunathan often glosses over what the reader’s score on the assessment means. Three times I took quizzes at the end of a chapter, and was left without any indication of what my score meant. For example, my score was a 5. A score of 8 and higher means this. A score of 3 or lower means this. Well, what does my score of 5 mean? The author threw a lot at the wall. Some of it stuck, much of it didn’t. The author presents happiness “sins” and happiness “habits”. He concludes that the three things needed for happiness (without giving anything away) can be abbreviated “MBA” (Get it? He’s a business professor.) Above all else, the author mentions/promotes his website about a dozen times in each chapter… literally, hundreds of times throughout the book! I visited his website, however, did not use any of its resources. This was due to the fact you have to log-in with your full name, e-mail address, and/or access to your Facebook page. Depression is a topic one might speak to a therapist about with a reasonable expectation of confidentiality, not a topic in which you share your quiz results on social media. There is no cure-all for depression. Some people may find this book to be extremely helpful. Others will look to other sources for help. I took the “Satisfaction with Life” quiz at the beginning, middle, and end of the book. My score did not change. If I’m so smart, why aren’t I happy? I’m still asking myself that question. Happiness is not something you need to pursue, but it is a state of mind you need to cultivate every day, by accepting your life and its hardships and challenges. There is no secret, after all. You don't need to read a gazillion articles and a billion books to find to key to happiness. You just need to live your life, stop overthinking and trust everything will be allright at the end. Life is unpredictable and searching to control and understand it, reducing it to a mathematical equation with a precise result, is just not possible. Just go with the flow and enjoy your time here. Raghunatan's book is a well written self-help book, construct in a nice and easy to follow binary structure of "wrong way to think(obstacle)/good way to think(solution)". It is all based on experiences done with his students and on scientific facts, which is really interesting. The prose is easy to read and understandable for the average readers. All in all, it is a great edited book, one of the best and easy to follow on the subject in my opinion. We all need a little more of Raghunathan's theory in our life. The only word you need to remember for living your life is "common sense". За разлика от по-голямата част от останалата литература по въпроса, книгата отговаря на въпроса КАК? Много ми допада в книгата практичният подход на преподавателя по маркетинг, Радж Рагунатан. Радж разполага с необходимата академична подготовка в областта на психологията (доктор по психология и маркетинг), но също така и с приложния поглед на специалиста по маркетинг. Той не само прави преглед на изследванията в областта (докъдето се ограничават много голяма част от авторите), но също така ни пос За разлика от по-голямата част от останалата литература по въпроса, книгата отговаря на въпроса КАК? Много ми допада в книгата практичният подход на преподавателя по маркетинг, Радж Рагунатан. Радж разполага с необходимата академична подготовка в областта на психологията (доктор по психология и маркетинг), но също така и с приложния поглед на специалиста по маркетинг. Той не само прави преглед на изследванията в областта (докъдето се ограничават много голяма част от авторите), но също така ни посочва къде най-често грешим и какви навици е добре да развием, за да бъдем щастливи. Освен това предлага креативна система от упражнения с цел развиване на тези навици. No spectacular new findings but an impressively well researched round-up with practical to do's. Make yourself happy and go for it. as long as happiness is our main goal in life. in some of them . In general , Each time I read A help_self book I recognized Why I don’t like this subject, And in each new . But I enjoyed reading it. Raj Raghunathan does a fantastic job of hitting home on the root causes of our unhappiness. Through the use of interesting and eye-opening case studies backed by rigorous testing and research, 'If You're So Smart, Why Aren't You Happy?' is no doubt one of the best science-backed resources to help you start prioritizing happiness released this year. Each chapter provides VERY practical exercises in combating the 'deadly happiness sins' as Raghunathan likes to call them. 1. De Raj Raghunathan does a fantastic job of hitting home on the root causes of our unhappiness. Through the use of interesting and eye-opening case studies backed by rigorous testing and research, 'If You're So Smart, Why Aren't You Happy?' is no doubt one of the best science-backed resources to help you start prioritizing happiness released this year. This is a book for the shelves and one to pass onto others for sure. This book is awesome! I've read a zillion happiness books (and sort of heart them all), but what sets this one apart is that it's both a review of the literature (in a fun, anecdotal way) and also a little guide book: Seven happiness killers and seven happiness exercises. SUPPOSEDLY there's a Website that has the exercises and little assessments and such, along with a free Coursera course, but I finished this like 5 days after he launched his Web site, and it was performing crash/craptastically. This book is awesome! I've read a zillion happiness books (and sort of heart them all), but what sets this one apart is that it's both a review of the literature (in a fun, anecdotal way) and also a little guide book: Seven happiness killers and seven happiness exercises. SUPPOSEDLY there's a Website that has the exercises and little assessments and such, along with a free Coursera course, but I finished this like 5 days after he launched his Web site, and it was performing crash/craptastically. Besides the crashtastic Web site (www.happysmarts.com), which I'm sure will improve, this book hit the spot for this happiness-obsessed guy. Practical, little habits to help boost happiness and reduce unhappiness. I received this book through a Goodreads giveaway. I enjoyed the approach of the book where the author lays out happiness killers and then presents approaches to overcome our own roadblocks. I thought the book was insightful and realized I am guilty of several of these happiness killing habits. I felt all the recommendations were practical and achievable. Definitely worth reading. The author has put in six years of work and this essentially reaffirms the behaviour one needs to cultivate to live a happier life. Giving and mindfulness are the key takeaways for me. Great effort. To re-read in October 2016. This review has been hidden because it contains spoilers. To view it, click here. As a follow-up to the Coursera course on Happiness this book is a wonderful read ... would recommend it for everyone. Brilliant. I began this book because I was curious about an analysis and theories of the conditions that bring about unhappiness/happiness. So an academic kind of interest. However not long after starting I realised that many of the strategies or choices that Raj describes that contribute to unhappiness are strategies that I have instinctively adopted in my life. So I'm perhaps not as happy as I thought I was - and I considered myself pretty happy. From time to time, the book can get a little too Brilliant. I began this book because I was curious about an analysis and theories of the conditions that bring about unhappiness/happiness. So an academic kind of interest. From time to time, the book can get a little too excited about relating the results of psychological experiements that are the underpinning of many of his happiness habits/strategies. But the gold is the way he distils many contemporary theories in positive psychology succinctly, and then sends you on your way with realistic exercises and strategies. As he himself admits, if you read the book but didn't do the exercises, the value of the book would be limited. But if you didn't read the book, but did the exercises, you'll probably get a lot more out of the book. I mostly liked this book. And that's noteworthy because for large parts of it I didn't like the book. Particularly in the early chapters, many sections seemed like broad sweeping statements based purely on in-class quizzes that the author gave his students over the years to build up this edifice of logic about how to be happy across a variety of factors. Much of that edifice felt poorly grounded and I don't buy the full validity of his in-class sampling as research. That said, the end results of I mostly liked this book. And that's noteworthy because for large parts of it I didn't like the book. Particularly in the early chapters, many sections seemed like broad sweeping statements based purely on in-class quizzes that the author gave his students over the years to build up this edifice of logic about how to be happy across a variety of factors. Much of that edifice felt poorly grounded and I don't buy the full validity of his in-class sampling as research. Happiness; all its aspects, are examined and analysed in detail, in a scientific manner, fortified with the results of a host of experiments carried out by the masters of the subject. At many points, readers are asked to participate in exercises, for them to know, how their own minds work in connection with one or the other aspect of happiness. The book certainly contributes to the reader's quest for happiness. The book is for serious reading, and will be revisited by a serious reader. I enjoyed this book. A great read for those who rely heavily on logic and reasoning in making decisions. The book has 7 sections in which you can apply changes, and one of them is overthinking choices. The author argues in depth in one of the sections that relying on your gut instinct can save you time and increase happiness on choices that is not measurable. Good actions steps and guides to apply to your life. Also, there is a coursera course to go along if you need extra guidance. I heard about the book from the Art Of Charm podcast series and was captivated by the research and ideas right away. Such a good compilation of research and interesting finding combined with exercises on how we can improve our own happiness. Definitely recommend this book! Why are smart people not happy? Because they don't actually choose happiness, but often chooses money and fame instead. The author listed many practical ways to increase our happiness level, such as finding flow, get connected, be trusting, help others Etc. A most informative and well researched book. This book highlights how something that make us smart and successful can undermine our happiness. Hearty Thanks to iMusti. I took his class and it was excellent. I hope to refer back to this book. A really good book about human behavior and meta-cognition. Highly recommend it to all interested in psychology, behavior and self-analysis. A nice summary of lots of different research topics on happiness jammed into one book. This actually accompanies his lectures at Coursera and includes (too) many references and links to it. It contains personal tales, theoretical info on why something works a way and practical bits and pieces on how to improve your happiness on each chapter. Like another reviewer said, it's actually nothing new, but the more I read books like this, the more the concepts are printed into my brain. Altruism, minim A nice summary of lots of different research topics on happiness jammed into one book. This actually accompanies his lectures at Coursera and includes (too) many references and links to it. It contains personal tales, theoretical info on why something works a way and practical bits and pieces on how to improve your happiness on each chapter. Like another reviewer said, it's actually nothing new, but the more I read books like this, the more the concepts are printed into my brain. Altruism, minimalism, consumerism, captialism, buddhism are all touched upon and neatly sewed together with one common cause. I bought this book after taking the free Coursera course, A Life of Happiness and Fulfillment, by the author. It makes a good reference but was not as easy to work through as the course. I think this is due to more info provided. Not a bad thing but it can be a challenge to process. Usually, with books like this, there's a lot of fluff and unrealistic approaches to the challenges of life. This book actually has legit psychological info and practical steps-- not touchy-feely fluff that may or may I bought this book after taking the free Coursera course, A Life of Happiness and Fulfillment, by the author. It makes a good reference but was not as easy to work through as the course. I think this is due to more info provided. Not a bad thing but it can be a challenge to process. Usually, with books like this, there's a lot of fluff and unrealistic approaches to the challenges of life. This book actually has legit psychological info and practical steps-- not touchy-feely fluff that may or may not apply to you. I totally recommend the free course and the book to anyone and everyone. The book can be boring and quite long. There's also a lot of survey questions which I skip as the questions seem to be for primary school students. The book focus on the negative and tell us to avoid them. Not bad but kind of boring and long winded. Define what is happiness and find happiness in everyday situations. Don't devalue happiness. Make happiness your priority. Don't compare ranks. Pursue your flow. Don't be desperate for love or full control. Don't be too distrust in. Don't over think. Mast The book can be boring and quite long. There's also a lot of survey questions which I skip as the questions seem to be for primary school students.